When I think of spring, rhubarb comes to mind. After all, rhubarb grows around this time of year, and farmers markets are loaded with it. Rhubarb is also most often found in rhubarb pie. And because it’s packed with nutrition, there are various rhurbarb health benefits to consider. What is rhubarb exactly? Is it a fruit or vegetable? That answer is a little confusing. Some believe that it’s a fruit due to its sweet and tart taste; however, experts say it’s technically a vegetable. Interestingly enough, it is legally classified as a fruit due to a U.S. Customs Court ruling from 1947. No matter what you call it, rhubarb is very delicious and contains a lot of beneficial nutrients like vitamin K and vitamin C. As a result, rhubarb benefits digestion; strengthens bones; prevents brain disorders; reduces inflammation; and more. This article details rhubarb, its many benefits, and how to use it with some delicious rhubarb recipes. The rhubarb plant is native to Siberia, and various regions of North America and Europe. Botanically, rhubarb belongs to the Polygonaceae family, and the genus Rheum. Rheum is derived from the ancient name of the Volga River, Rha, where rhubarb grows. 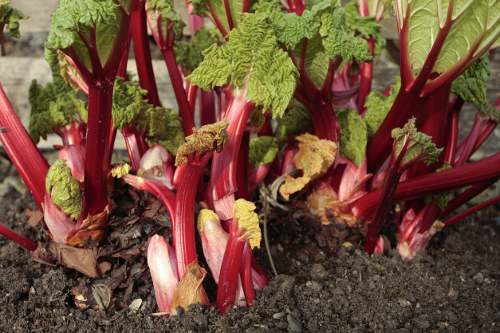 Rhubarb (Rheum rhabarbarum) plants grow from thick and short underground stems called rhizomes. The rhubarb leaves emerge from the rhizomes and flower stalks, and flowers may bloom in the spring. The rhubarb stalk, or the petiole, may have a combination of red, green, or pink colors; however, pink, and red have the better flavor. Harvesting rhubarb does not happen in the first year, and it can sometimes take two to three years for a good harvest. When harvesting, the rhubarb stalks are carefully cut or pulled from the plant, and the poisonous leaves are removed. The stalks and flowers are the only edible parts of rhubarb, while the leaves and roots of rhubarb are poisonous due to the oxalic acid, which is toxic to the kidneys. That being said, to really activate the oxalic acid you would need to consume very large amounts of rhubarb leaves. However, it is best to avoid the leaves to safe, especially if there has been a frost. Frost and freezing temperatures can even cause the leaves to leach oxalic acid to the stalk, which will also lose their firmness, flavor, and may become dangerous. Rhubarb is loaded with nutrition. What are the rhubarb nutrition facts? A cup of raw rhubarb contains 5.5 grams of carbohydrates, 2.2 grams of fiber, and 1.1 grams of protein. From a micronutrient perspective, rhubarb contains 45% of the recommended daily amount of required vitamin K. Rhubarb also contains good amounts of manganese, calcium, potassium, and vitamin C.
The following is a comprehensive rhubarb nutrition chart with information for one cup of diced raw rhubarb, or 122 grams of the vegetable. Rhubarb has been used in traditional Chinese medicine for over 2,000 years, and in Mandarin, it is called da huang, which refers to the yellow root of rhubarb. The famous Venetian merchant traveler, Marco Polo, often shared his knowledge of Chinese rhubarb rhizome throughout his travels. There are several potential rhubarb health benefits to keep in mind. For instance, rhubarb is said to have antioxidant, astringent, anti-parasite, laxative, anti-inflammatory, and anti-microorganism properties. As an antioxidant, rhubarb contains quercetin, which helps gives plants their color. Several free-radical scavenging antioxidants have been identified in rhubarb seeds, such as myricetin, hyperoside, quercitrin, and epicatechin. What are other reported rhubarb health benefits? The following are five more rhubarb benefits to consider. The fiber in rhubarb may be useful for digestion. A study published in the Chinese Journal of Burns in 2011 found that rhubarb can protect the intestinal wall through increasing secretion of gastrointestinal hormones, and providing normal muscle contraction to help mix the contents within the GI tract. The purgative, or laxative, properties of rhubarb may help decrease strain during bowel movements. As a result, eating rhubarb could help relieve hemorrhoid pain, and treat diarrhea and constipation. That being said, digestive upset relief often results from medicinal rhubarb extracts, tinctures, and powders. The dose should be recommended by your doctor since overconsumption of rhubarb can worsen the condition. The anti-inflammatory properties of rhubarb have long been used to promote good vision and healthy skin. A study published in the American Journal of Chinese Medicine in 2012 determined that rhubarb extract shows significant efficacy for healing inflammatory cells when used after an infection. A number of brain disorders are caused by oxidative stress. Oxidative stress can lead to neuronal apoptosis (programmed cell death of neurons) and other chronic brain diseases, including Alzheimer’s disease, stroke, and amyotrophic lateral sclerosis (ALS). A study published in the journal Molecular Medicine Reports in 2015 found that rhubarb extract significantly reduced irradiation-induced brain inflammation. This shows the protective effect of rhubarb against oxidative stress; therefore, it could potentially prevent brain disorders like stroke, ALS, and Alzheimer’s disease. The vitamin K in rhubarb has a significant beneficial role in bone metabolism, and may also protect against osteoporosis. Vitamin K is necessary for the process of bone formation, bone maintenance, and bone resorption. Vitamin K deficiency can affect these processes, and increase the risk of osteoporosis. Studies have also found that vitamin K may strengthen bones by improving bone mineral density and reducing the risk of fractures. As mentioned, spring is best time to harvest rhubarb, often from April to June. The best place to find rhubarb is at farmers markets and most grocery stores. Rhubarb stalk when eaten alone is very tart and sweet; therefore, it tastes best in pies, jams, and combined with other fruits like strawberries. Rhubarb stalks can last for about three weeks in the refrigerator when tightly wrapped in plastic wrap. Unopened rhubarb flowers are also a delicacy in northern Asia. Puree the apple and rhubarb until smooth in a high-speed blender or food processor. Pour the rhubarb/apple mixture into a medium pot, and mix in vanilla, almond extract, cinnamon, and honey. Bring to a boil, and stir occasionally. Reduce the simmer, and continue to stir every four to five minutes. In total, cook for 15 to 20 minutes until you reach desired consistency. When done, pour into a jar, cool, and store in the fridge. Puree the apple, strawberries, and rhubarb until smooth in a high-speed blender or food processor. Pour the rhubarb, apple, and strawberry mixture into a medium pot, and add honey, cinnamon, vanilla, and almond extract. Bring to a boil, and stir occasionally. Reduce the simmer, and continue to stir every four to five minutes. In total, cook for around 30 minutes until you reach desired consistency. Soften the rhubarb for 10 to 15 minutes by simmering it in a few tablespoons of water over medium heat. Remove the rhubarb when it begins to fall apart, and place it in a high-speed blender or food processor. Add all remaining ingredients, and blend until a puree has formed. You can eat the salsa right away, but it does taste better when you let it sit at room temperature for a few days in a Mason jar, with a half cup of sauerkraut juice. In a small pot, simmer the rhubarb with up to a half-cup of filtered water for about five minutes, or until soft. Remove from the heat, and set aside to cool. Place the rhubarb into a high-speed blender or food processor, and add mustard, vinegar, and honey. Pulse until smooth, and with the blender or food processor running slowly, pour in the olive oil. Rhubarb is delicious, and I’m sure you will enjoy the rhubarb recipes above. They’ll really make you look at rhubarb in a whole new way. But, although there are many rhubarb health benefits, it is important to remember that rhubarb poisoning can occur when the leaves are consumed. Some side effects may include gastrointestinal problems due to the oxalic acid in the leaves. It is also best to consult your doctor before consuming rhubarb if you have liver problems, kidney disease, or are pregnant. While rhubarb stalks are likely safe, there have been concerns with combining some medications with medicinal rhubarb. “Rhubarb, raw Nutrition Facts & Calories,” SELFNutritionData; http://nutritiondata.self.com/facts/fruits-and-fruit-juices/2056/2, last accessed April 27, 2017. “What Is Rhubarb Good For?” Food Facts Mercola; http://foodfacts.mercola.com/rhubarb.html, last accessed April 27, 2017. “Rhubarb nutrition facts,” Nutrition-and-you.com; http://www.nutrition-and-you.com/rhubarb.html, last accessed April 27, 2017. “7 Amazing Benefits of Rhubarb,” Organic Facts; https://www.organicfacts.net/health-benefits/fruit/rhubarb.html, last accessed April 27, 2017. “Quick and Sweet Rhubarb Butter & Strawberry Rhubarb Butter,” Meghan Telpner; https://www.meghantelpner.com/blog/quick-and-sweet-like-rhubarb-butter/, last accessed April 27, 2017. Faber, K., “Rhubarb Salsa,” Traditional Cooking School, June 25, 2014; http://gnowfglins.com/2014/06/25/rhubarb-salsa/. “Rhubarb Vinaigrette,” Dinner with Julie, July 15, 2011; http://www.dinnerwithjulie.com/2011/07/15/rhubarb-vinaigrette/. Meng, Y.B., et al., “[Influence of rhubarb on gastrointestinal motility and intestinal mucosal barrier in patients with severe burn],” Chinese Journal of Burns, October 2011; 27(5): 337-340. https://www.ncbi.nlm.nih.gov/pubmed/22224253. Xiong, H.R., et al., “The inhibitory effect of Rheum palmatum against coxsackievirus B3 in vitro and in vivo,” American Journal of Chinese Medicine, 2012; 40(4): 801-812, doi: 10.1142/S0192415X12500607. Lu, K., et al., “Rhubarb extract has a protective role against radiation-induced brain injury and neuronal cell apoptosis,” Molecular Medicine Reports, August 2015; 12(2): 2689-2694, doi: 10.3892/mmr.2015.3693.